Mages Guild is a well-known faction in Elder Scrolls games, also present in Elder Scrolls Online. Any player can join it regardless of Alliance. Mages Guild skill line has a number of different Magicka-based abilities. Gaining experience with Mages Guild in ESO is currently very hard, because levelling Mages Guild skill line takes a long time and a lot of effort. Most importantly it requires a lot of exploration and looking out for lorebooks. 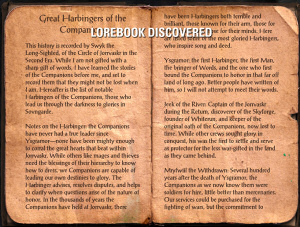 Finding lore books scattered around Tamriel. In the latest Beta build every read lore book increases your experience with Mages Guild by 5, so you can imagine how painfully slow a method this is. Completing quests for the Mages Guild. Mages Guild skill line includes one ultimate skill, four active skills and five passive skills. The ultimate skills and active skills can be morphed when they rank up. Morphs change the original skill by tweaking it in one way or another. Each ultimate skill and active skill have two morph options. Once you have morphed an ability, it will replace the original ability. Morphing a skill takes a skill point. Deals 44 Fire Damage to target and 22 Fire Damage to nearby enemies. All affected enemies are knocked back. Deals Cold Damage instead of Fire Damage, and affected enemies are snared by 70% for 5 seconds. Restores 9 Ultimate for each enemy hit. Summons a light that reveals hidden and invisible enemies within 12 meters. Reduces Max Magicka by 5% and increases Spell Critical strike chance by 7%. Spell Critical strike chance increased by 17%, up from 7%. Nearby friendly targets take 50% less damage from stealthed attacks. Deals Magic Damage to enemy over 12 seconds and restores Health to player every 6 seconds. Additional 15% chance on hit with weapon attack to heal player for 100% of damage caused. Increases Max Health by 5% while ability is slotted. Creates a Fire Rune at target location for 30 seconds, dealing 15 Fire Damage when an enemy enters the area of effect. Affected enemies also take 8 Fire Damage over 10 seconds. Affected enemy is knocked into the air and stunned for 3 seconds. Increases Health recovery for 20 seconds. Reduces the Magicka cost of next ability activated by 25% if cast within 5 seconds. Allows you to persuade certain NPCs in conversations. Reduces cost of Mages Guild abilities by 8%. Increases duration of Mages Guild abilities by 10%. Increases Magicka and Magicka regeneration by 1% for each Mages Guild ability slotted. Casting a Mages Guild ability increases Spell power by 10% with your next magical attack for 8 seconds.